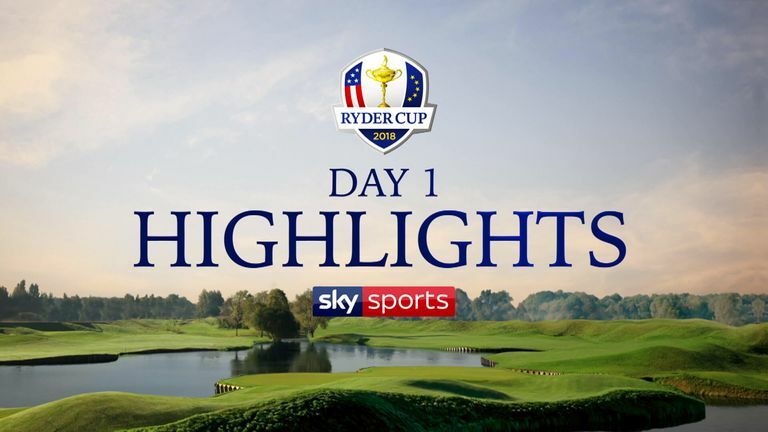 Highlights from a record breaking day one for Team Europe at the Ryder Cup in Paris. Team Europe produced a historic fightback to sweep the afternoon foursomes and claim a 5-3 lead over the USA after a riveting opening day of the 42nd Ryder Cup. It was Europe's first clean sweep of one session since 1989, and their first foursomes whitewash in the history of the contest, and represented a momentous recovery from a morning session blighted by mistakes and missed opportunities. Thomas Bjorn's side were given momentum to take into the afternoon foursomes after Tommy Fleetwood and Francesco Molinari prevented an American clean sweep of the opening session for the second Ryder Cup in a row with victory over Patrick Reed and Tiger Woods, who both sat out the afternoon. Justin Rose, reunited with Henrik Stenson having suffered an agonising final-hole defeat with Jon Rahm in the opening match of the competition, led from the front and cruised to a 3&2 win over Dustin Johnson and Rickie Fowler. Sergio Garcia moved a step closer to becoming the leading points scorer for Europe as he partnered Alex Noren to a thumping 5&4 win over Phil Mickelson and Bryson DeChambeau having won a remarkable seven of the first nine holes. Rory McIlroy and Ian Poulter evoked memories of their famous Saturday afternoon win at Medinah in 2012, albeit in a different format, as they fought back from being two down after three holes against Bubba Watson and Webb Simpson to romp to a 4&2 win. Fleetwood made it two wins from two on his Ryder Cup debut, as the Englishman again partnered Molinari to a handsome 4&3 win in the final match of the session, this time over Jordan Spieth and Justin Thomas. With a fresher afternoon breeze making Le Golf National a tough prospect after lunch, pars were often enough to win holes as the Europeans prospered and the holders struggled for consistency. Rose and Stenson made the first significant move of the afternoon when, after halving the first four holes against Johnson and Fowler, the home pair reeled off three wins in a row, needing only one birdie in the process. Pars were also enough to win the 10th and 11th before Johnson and Fowler won their first hole of the afternoon, and a birdie at the next reduced the deficit to three down with five to play, but three halves closed out victory for the home pair. Don't miss a minute of the action with our dedicated Ryder Cup channel. Find out more. McIlroy was the only player in the morning session without a birdie on his card, and his day took another turn for the worse when he and Poulter gifted away the first hole to a Watson and Simpson par. The Americans went two up at the long third, but McIlroy finally got a putt of note to drop for birdie at the eighth which sparked a run of four consecutive holes won, three of them with pars as Watson and Simpson became ragged. Watson did respond with a stunning tee shot in close to set up a win at the 11th, but they made their fourth bogey in five holes to lose the next before McIlroy knocked a remarkable second from a hanging lie close to water to 12 feet at the 13th and Poulter rattled in another putt for a win. 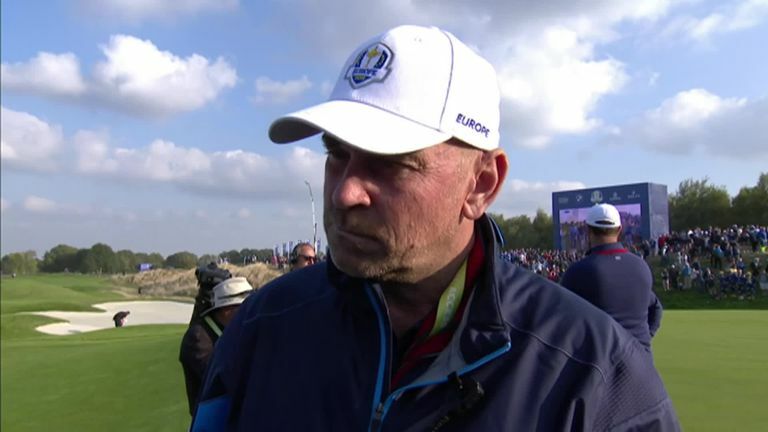 Captain Thomas Bjorn was pleased with being able to utilise the entire European team on day one but is not getting carried away. They maintained their advantage over the next two holes, and Watson and Simpson were forced to concede defeat on the 16th which took Bjorn's side into the overall lead. Noren enjoyed victory in his first Ryder Cup match alongside a rejuvenated Garcia as Mickelson and DeChambeau were swept aside in ruthless fashion, although the US duo contributed plenty to their own downfall. Three bogeys in four holes from the second gifted Europe a three-up lead, and Garcia and Noren turned the screw with two birdies, a par at the eighth, and another birdie at nine powered them seven up at the turn. The visitors did start the back-nine well as they won the 10th and 11th, but another dropped shot at the 12th made a birdie at 13 fairly irrelevant, with Garcia and Noren wrapping up a comprehensive win with four holes to spare. Molinari and Fleetwood were the stars for the home side in the disappointing morning session, and they continued their impressive partnership with a convincing win over the erratic pairing of Spieth and Thomas. The Open champion and the current European No 1 needed only two birdies to turn with a three-hole advantage, and a par proved enough to win the 10th as they looked to close out the second session in the same manner at the first. 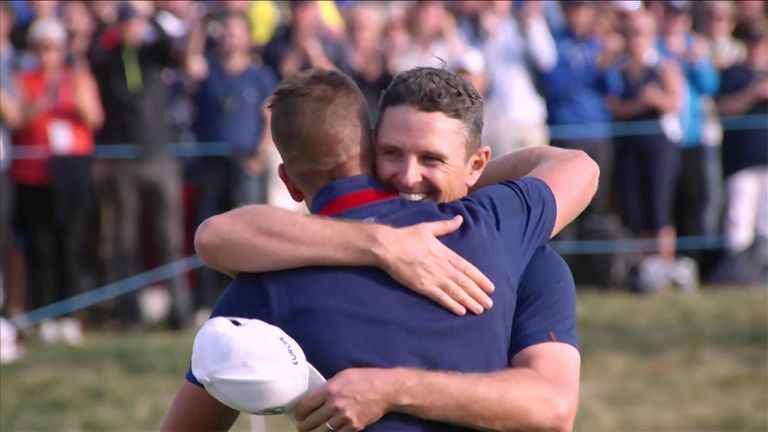 Thomas and Spieth did pull one back, but another bogey at 13 effectively put the match beyond reach as Europe celebrated a historic session of foursomes.